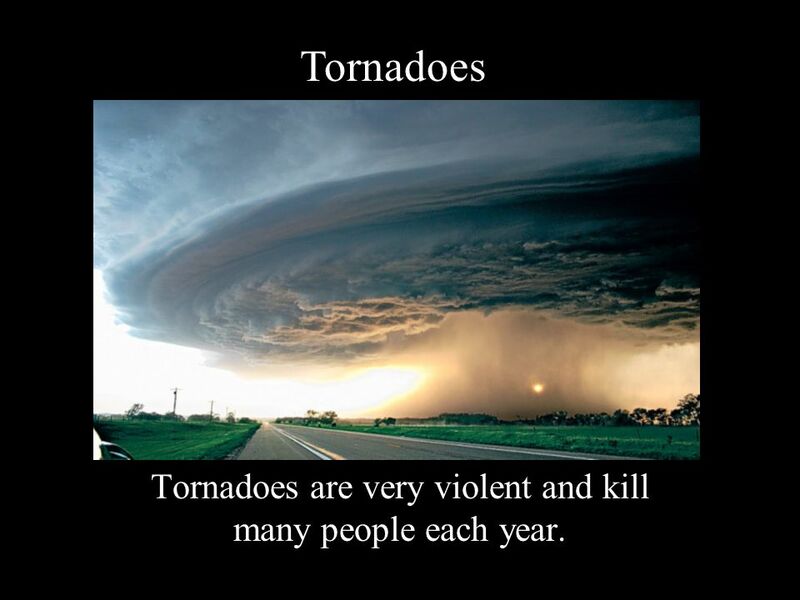 Tornadoes are very violent and kill many people each year. 1 Tornadoes are very violent and kill many people each year. 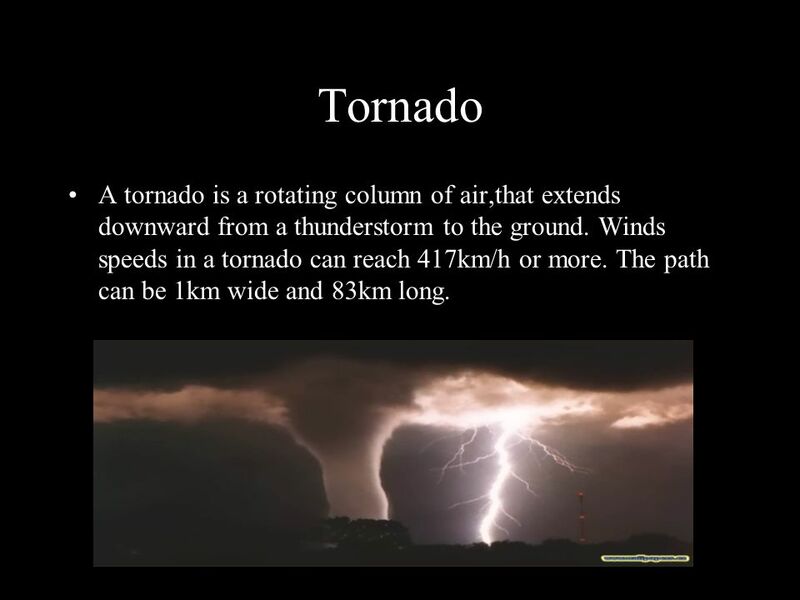 2 Tornado A tornado is a rotating column of air,that extends downward from a thunderstorm to the ground. 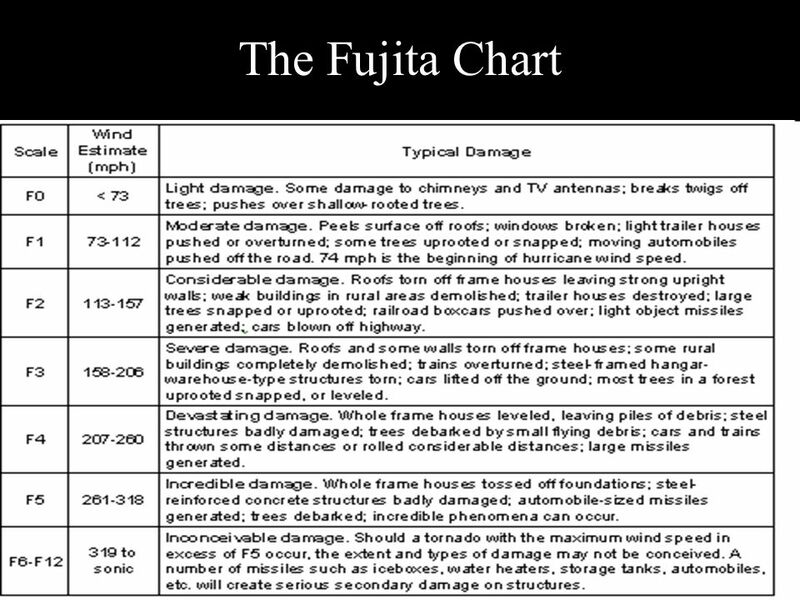 Winds speeds in a tornado can reach 417km/h or more. The path can be 1km wide and 83km long. 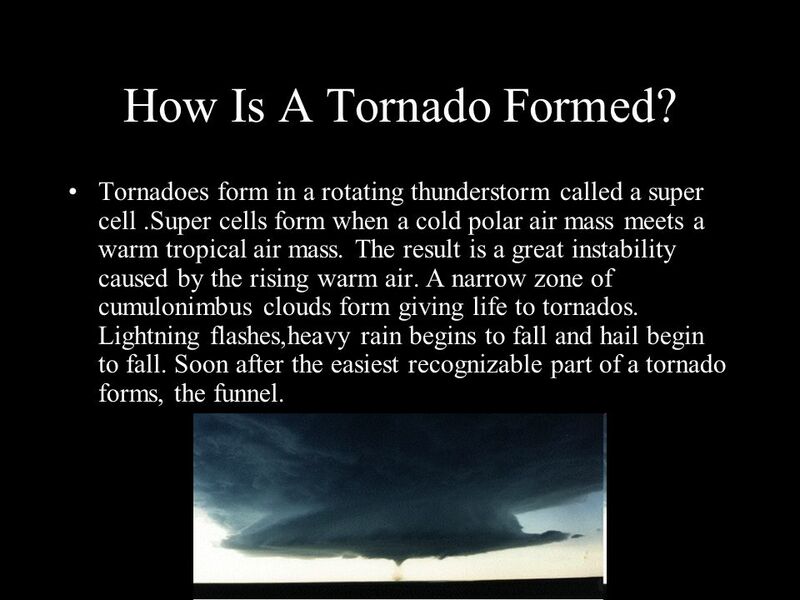 3 How Is A Tornado Formed? Tornadoes form in a rotating thunderstorm called a super cell .Super cells form when a cold polar air mass meets a warm tropical air mass. The result is a great instability caused by the rising warm air. A narrow zone of cumulonimbus clouds form giving life to tornados. Lightning flashes,heavy rain begins to fall and hail begin to fall. Soon after the easiest recognizable part of a tornado forms, the funnel. 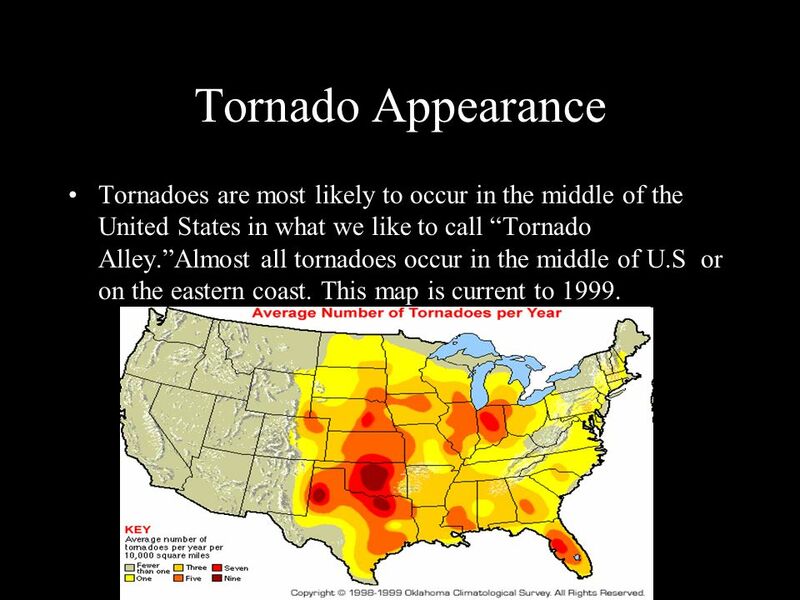 5 Tornado Appearance Tornadoes are most likely to occur in the middle of the United States in what we like to call “Tornado Alley.”Almost all tornadoes occur in the middle of U.S or on the eastern coast. This map is current to 1999. 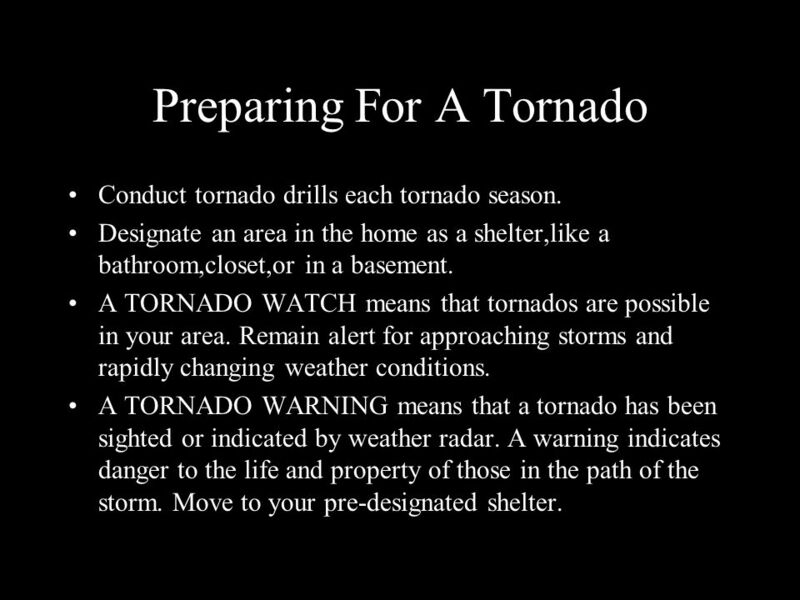 Conduct tornado drills each tornado season. Designate an area in the home as a shelter,like a bathroom,closet,or in a basement. A TORNADO WATCH means that tornados are possible in your area. Remain alert for approaching storms and rapidly changing weather conditions. A TORNADO WARNING means that a tornado has been sighted or indicated by weather radar. A warning indicates danger to the life and property of those in the path of the storm. Move to your pre-designated shelter. 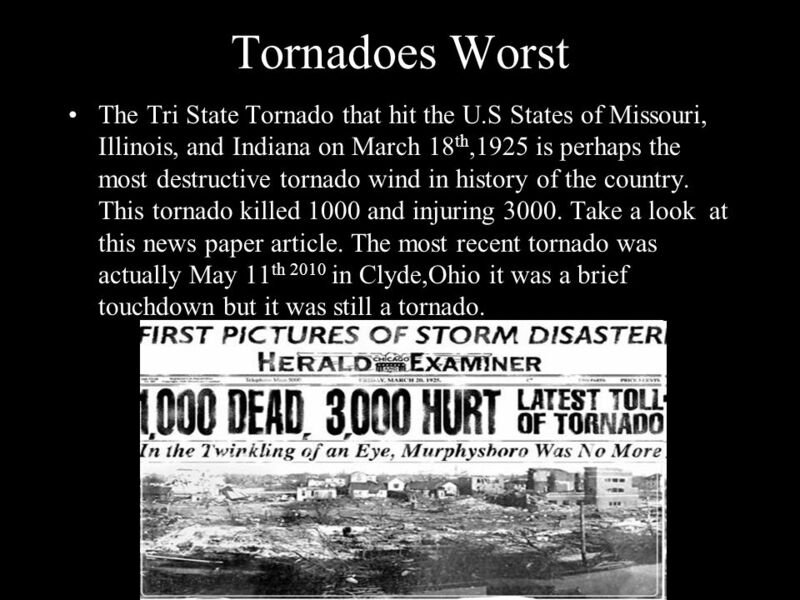 8 Tornadoes Worst The Tri State Tornado that hit the U.S States of Missouri, Illinois, and Indiana on March 18th,1925 is perhaps the most destructive tornado wind in history of the country. This tornado killed 1000 and injuring Take a look at this news paper article. The most recent tornado was actually May 11th 2010 in Clyde,Ohio it was a brief touchdown but it was still a tornado. 3 out of every 4 tornados in the world happen in the United States. A tornado in Oklahoma once destroyed a whole motel. People later Found the motel’s sign in Arkansas. 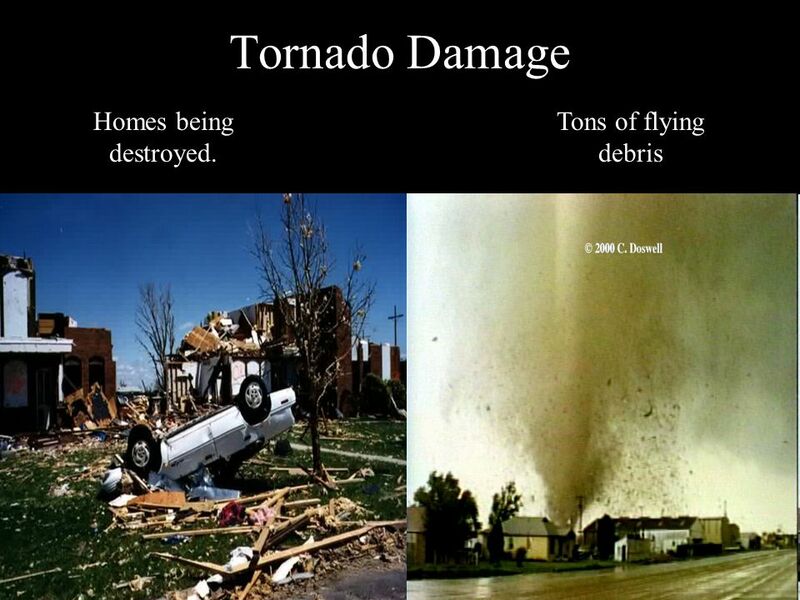 The United States has an average of 800 tornados every year. In 1928, a tornado in Kansas plucked the feathers right off some chickens. 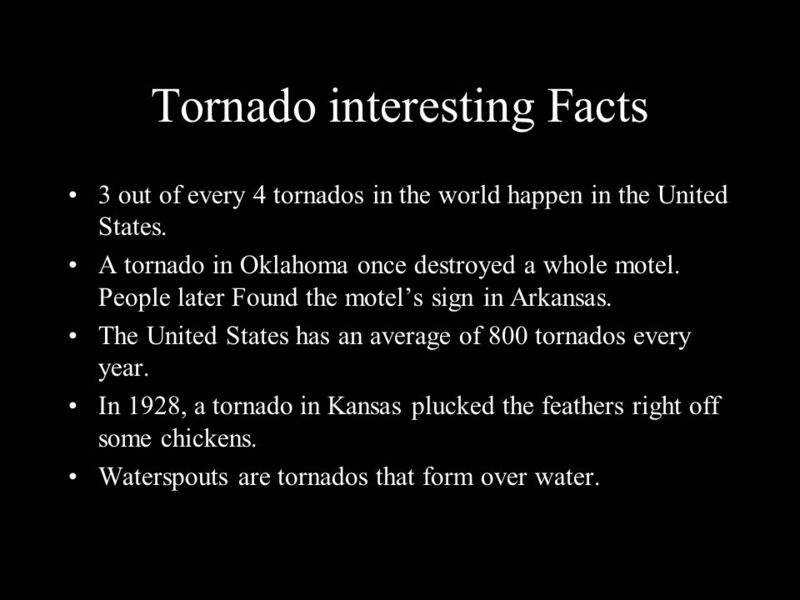 Waterspouts are tornados that form over water. 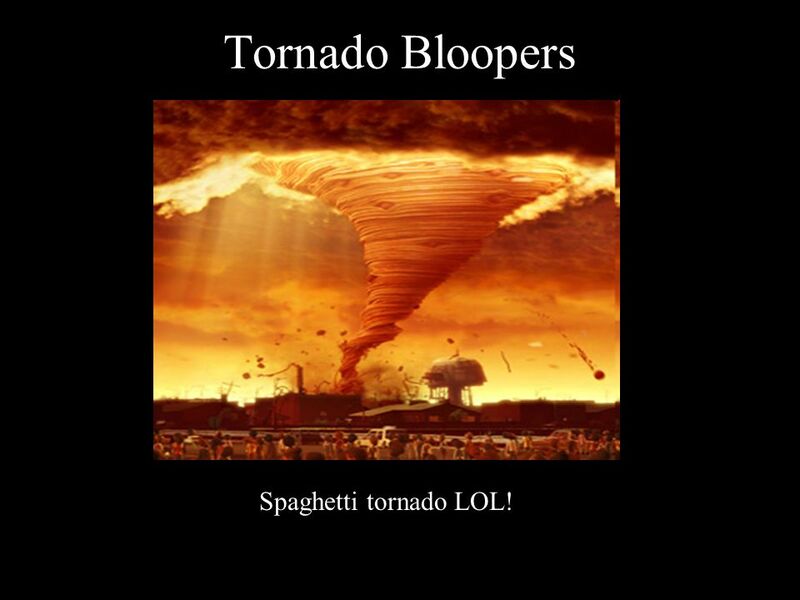 12 Tornado Bloopers Spaghetti tornado LOL! 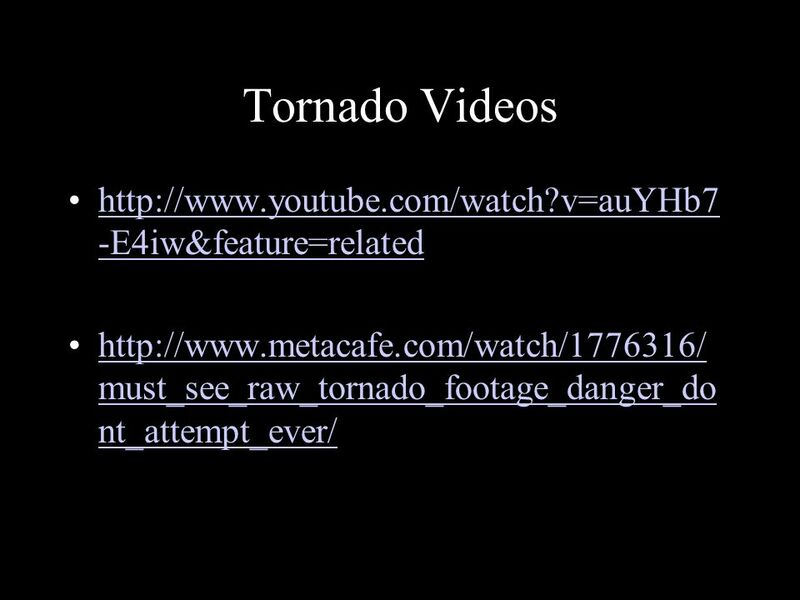 Download ppt "Tornadoes are very violent and kill many people each year." 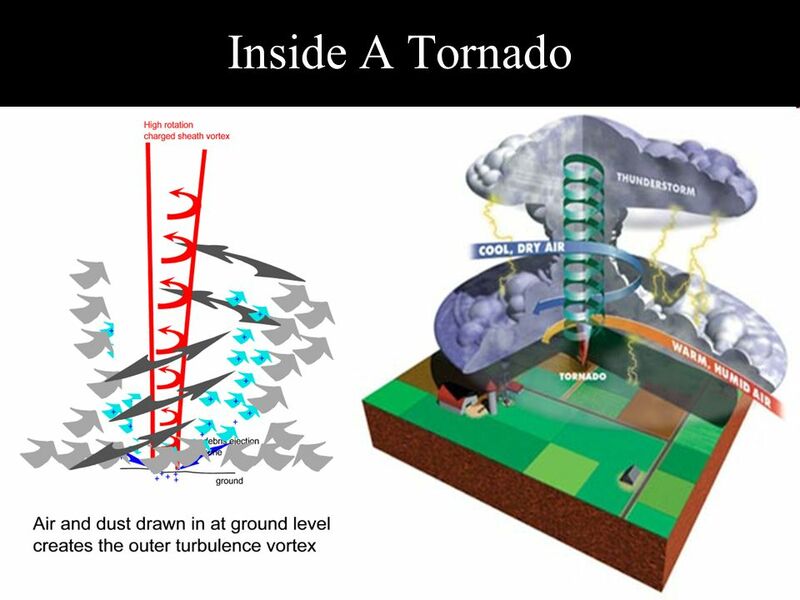 Tornadoes A tornado is a violently rotating column of air (vortex) in contact with the ground and a cumulonimbus cloud Tornadoes are capable of inflicting. Tornadoes Tornadoes Rapidly rotating, funnel shaped cloud. Rapidly rotating, funnel shaped cloud. Most locally destructive of all storms. Most locally. TORNADO Occur in many parts of the world Found most frequently in the United States east of the Rocky Mountains Most frequent during the spring and summer. Chapter 8: Lesson 3: What causes severe weather? Types of Severe WEATHER and Fronts Objective: Can I use meteorological data to predict weather? These are the major types of severe weather that we will learn about today Thunderstorms Tornadoes Hurricanes. Thunderstorms : Aim: What are the ingredients of a thunderstorm? SEVERE STORMS II Chapter 19 Test 5 material End TORNADOES ARE RAPIDLY ROTATING WINDS THAT BLOW AROUND A SMALL AREA OF INTENSE LOW PRESSURE DIAMETERS. 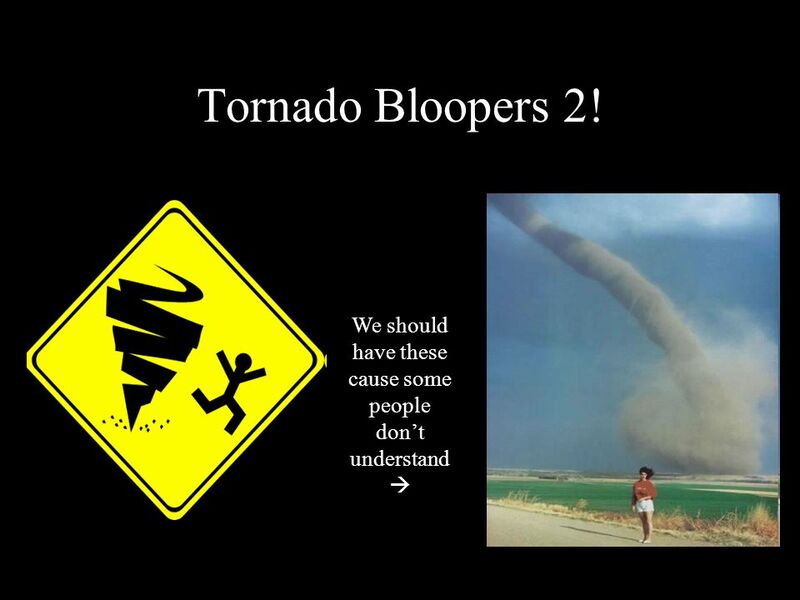 1 By: Michelle Burchanowski 2  Twisters  Funnel cloud  Waterspout Tornado Nicknames. October 20, 2014 Objective: I will be able to explain how, where, and why tornadoes form. Entry Task: DO NOT UNPACK – be ready for a new seating chart. Tornadoes Tornadoes We will be reading the book Night of the Twisters. The book is about tornadoes. Weather & Climate Severe Weather Objectives List and describe the main types of storms and explain how they form. List and describe basic safety for. Tornadoes Tornadoes By: Jacqueline, Liz, Richard, And Kyle By: Jacqueline, Liz, Richard, And Kyle. Chapter 17 Section 2 Severe Weather.